Great views and social features enhance this coastal cruiser. The operator was trying to get us wet. Maybe not at first, but it didn’t take long for a dousing to become his goal on a rolling two- to three-foot sea. A glint of mischief in his eye, Alexander Marine’s Jerry Wheeler drove the Carver C40 Command Bridge into a head sea from his perch on the covered but open flybridge, I in the companion captain’s chair next to him, and yet we remained dry. Our damp factor was kept at zero thanks in large part to the C40’s plumb bow, which carries the hard chine and spray rail far forward where they can knock down water before it has a chance to evade the hull’s defenses. That bow design also opens up the interior volume in the forward stateroom, which we’ll get to. 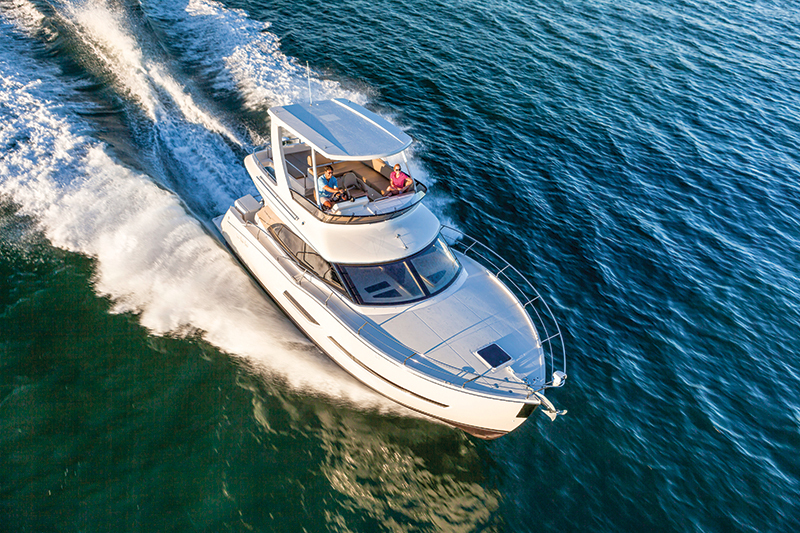 On the highly social flybridge, a forward-leaning Venturi windshield provides a stylish look and, thanks to the Plexiglas extension atop it, a bit of wind deflection at the helm. On our boat, the helm console was black molded fiberglass with an angled face and a flat base. A 12-inch Garmin MFD occupied the right side of the dash face, and a Cummins display was in the middle. The left third of the dash was unoccupied, though it could easily house another MFD or a couple of instruments. Call it owner’s choice. On the flattish base of the dash are the important switches, tab controls, the autopilot display and the engine throttles. The Cummins joystick — it controls the engines and the thrusters at slow speed — is situated on a dash extension, within easy reach of the driver. Wheeler used it efficiently to get the boat out of a crowded, L-shaped docking space at the Alexander Marine offices. 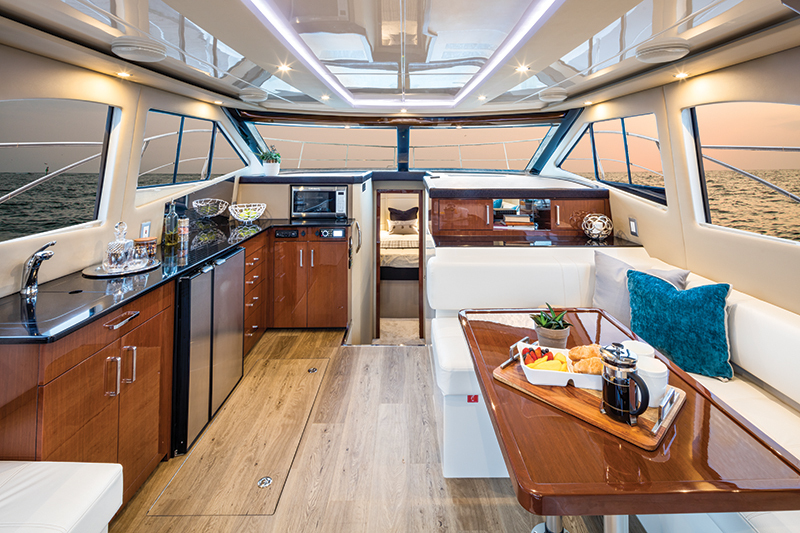 Overhead, a hardtop (optional) keeps the sun at bay, except at the aft end of the flybridge, which makes sense considering there’s a sunpad back there that’s big enough for three adults. (A bow sunpad is an option.) To port and aft of the helm chairs runs an L-shaped settee that can seat six and has four cupholders built into its armrests. A wood table is an option. While our test boat’s bridge was open, the area can be enclosed with canvas. From our perch at the boat’s only helm, visibility was excellent all around as we hit a top speed of 30 knots. At that speed, the twin Cummins QSB6.7 diesels were turning at 3010 rpm (Carver got 3070 rpm at WOT). Our test boat was new enough that we weren’t able to get fuel consumption readings, but Carver testing revealed a fuel burn of 38.2 gph at WOT. At 2650 rpm, the C40 reached 27 knots and the engine burned about 29.5 gph, which makes it a good cruising speed. The lower end of the cruising speed spectrum is at 2550 rpm, which yields almost 24 knots and a 28 gph fuel burn. Between 2550 rpm and 1600 rpm, fuel efficiency drops measurably, so owners will want to travel at just less than 10 knots or at 24 knots and faster, which shouldn’t be much of a surprise. While the boat reacted quickly to input from the helm, I found the wheel to be a little stiff, likely due to the fact everything was brand new and hadn’t been broken in properly. Even so, we carved a tight circle with a bit of a sportboat lean, which made the ride up top even more fun. Access to the boat is via a deep swim platform and up a set of off-center stairs that bring passengers into a social cockpit. An L-shaped settee hugs the port bulwark and the transom. On our test boat, a loveseat- sized bench was to starboard, but that can be replaced by a barbecue grill, if an owner so chooses. Wheeler explained that’s part of Carver’s cost-saving module building style. The base for the loveseat and the grill is the same, so the spot can be equipped with whichever option an owner chooses. 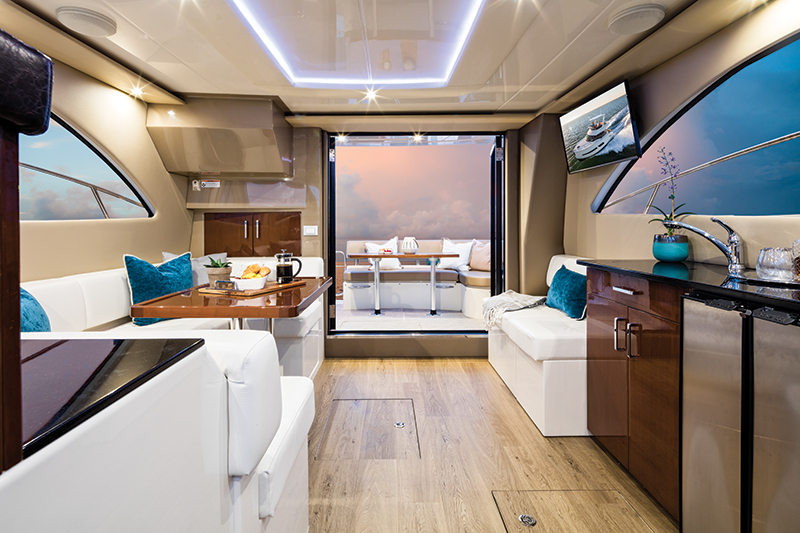 Through twin glass doors that swing out and secure open is the main cabin, where an economical use of space yields a salon/ dinette and a galley. With the doors open, the cockpit and cabin are one unbroken area, as has come to be expected by boat buyers: more sociability equals a better boat. A two-person settee is immediately inside to port, opposite a C-shaped settee that serves as a dinette and a berth when the table is lowered and a filler cushion is deployed. A TV is above the loveseat. The portside galley has a sink and a two-burner induction stovetop built into its L-shaped countertop. A cabinet under the sink and drawers below the stovetop provide storage, and a counter-height refrigerator/ freezer is between the cabinet and drawers. Forward is a microwave/convection oven and more storage. Six to eight people can gather indoors with four or five more in the cockpit, and with the doors open, anyone with cooking duties won’t feel left out. Our test boat had American cherry wood cabinetry and flooring, while the walls and furniture were upholstered in white and cream, for contrast. Black countertops and window frames added to the color palette. The cabin is flooded with natural light thanks to wraparound windows that from the outside look like designer sunglasses. Down three centerline stairs is a companionway that leads to both staterooms and both heads. Immediately to starboard at the base of the stairs is the guest stateroom, which has full headroom at the entrance but only sitting headroom at the head of the berths. Its twin berths can be combined to form a full one, with the help of a filler and tracks built into the floor that allow the port berth to slide. A hull window with an opening porthole takes care of light and air, and a hanging locker accommodates the clothes. A forward door provides private access to the second head, which is a wet head with a shower curtain. Forward, taking advantage of the plumb bow, is the master stateroom. 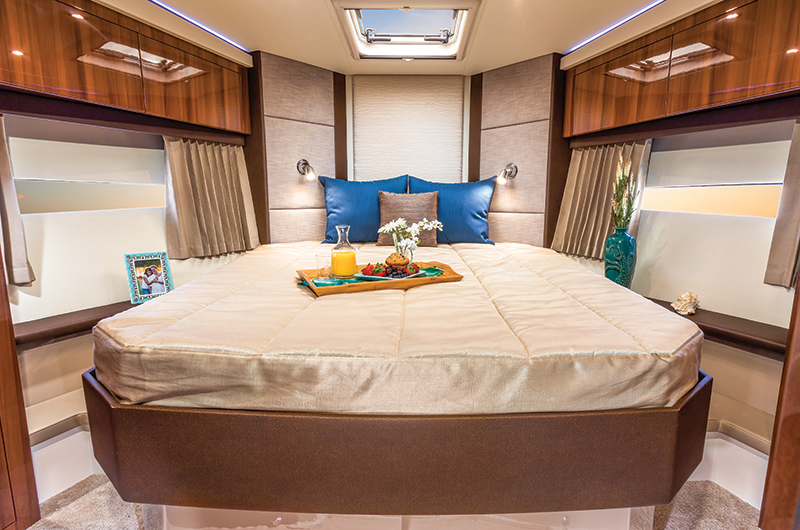 The head of the berth isn’t pinched like in many V-berths, resulting in room for a queen-size island bed with nightstands and reading lights. Twin hanging lockers are aft, overhead cabinets flank the berth and long hull windows let in abundant natural light. In the en suite head is an enclosed fiberglass shower stall with a bench seat. 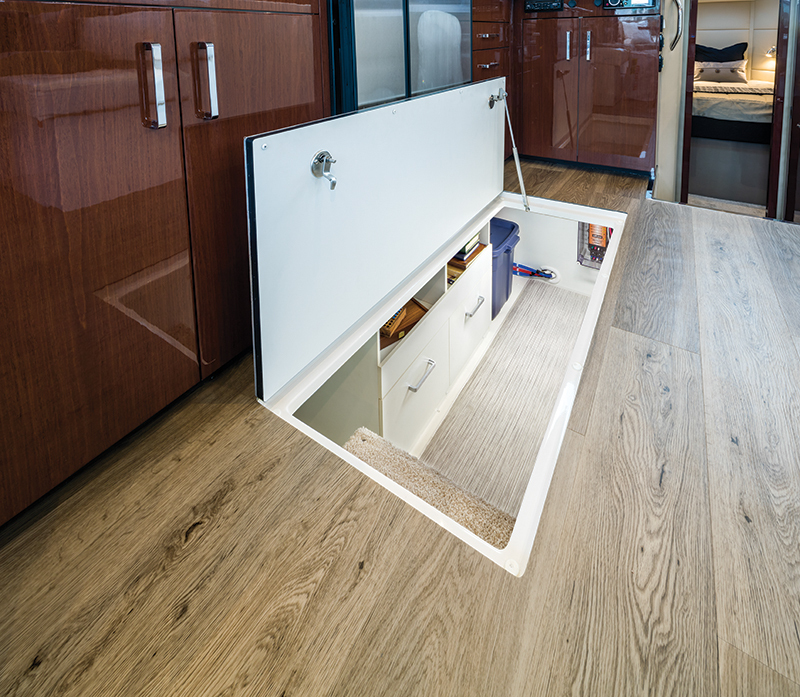 It shares the space with a Raritan electric toilet, a vanity with a vessel sink, a tile backsplash that features all the colors of the boat, and an opening port. 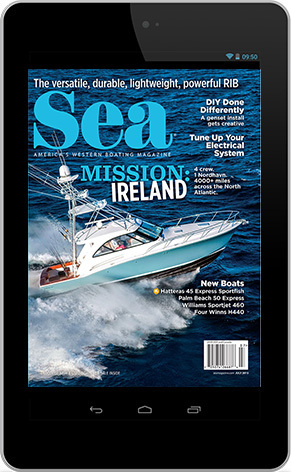 In a world where 40- to 42-foot boats can exceed $1 million, a 40-foot flybridge boat with two staterooms and two heads that starts a little north of $500K and comes very well equipped for just more than $700K is likely to appeal to a lot of people. It can sleep six (though owners don’t have to make that fact known), cruise four and easily accommodate a dozen for a daytrip or a cocktail sunset cruise. 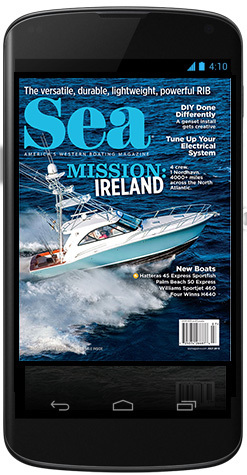 And if the weather and seas aren’t perfect, the C40 can handle it, especially if a flybridge enclosure is added. LOA 39 ft., 10 in. Beam 13 ft., 10 in. Draft 3 ft., 11 in. Twin 305 hp Cummins QSB6.7 diesels, refrigerator/freezer, convection/microwave, electric cooktop, Raritan toilets, LED lighting, trim tabs, hydraulic steering and more. 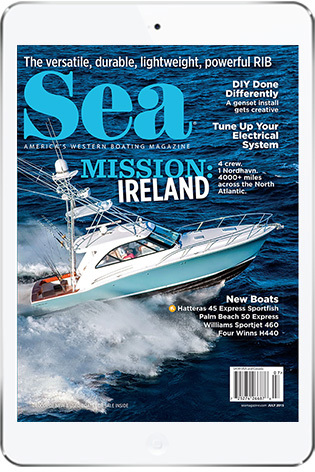 Twin 380 hp Cummins QSB6.7 diesels, Cummins joystick w/bow thruster, 11 kw Kohler genset, autopilot, 28,000 Btu AC, hardtop, wood sole in main cabin, 2-burner cooktop, underwater lighting and much more. This entry was posted in Boat Tests and tagged flybridge, carver yachts, command bridge, c40 by Stephanie Shibata. Bookmark the permalink.